At present time, multiple monitors are commonly used by employees of companies in various sectors. If now you’re using dual or multiple monitors, perhaps you find difficulties in managing it efficiently. You need a special tool to help you manage the displays of all monitors! For dual monitor or multiple monitor users that apply Windows operating systems, I suggest you to install Actual Multiple Monitors from Actual Tools. 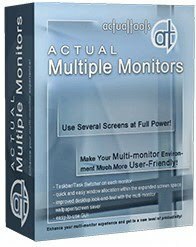 Actual Multiple Monitors is an easy to use application that allows you to work efficiently with dual or more monitors on your system. Whatever your Windows operating system, this tool inserts a copy of the original Windows Taskbar on every monitor display. It will help you to shorten and unite the task management on all monitors. The taskbar will reflect the applications being showed on the monitor, so, all monitors are reachable and observable at all times. The extra Title Bar button on each application is very helpful. It’s a time-saving feature, as you can shift your application to a different monitor with just one click. With Actual Multiple Monitors, you can manage the extend taskbar on the screens of secondary monitors. This tool will also facilitate you to have different screen savers and backgrounds for every monitor in your multiple monitors display. For getting more information on all features provided by Actual Multiple Monitors, you can visit the website. If you’re a multiple monitor user, you should try this software! Make a Safest Playground for Your Children! Get Your Own at Home Spa Experience!